As a child I adored cheap artificial green apple smell in deodorants, soaps and chewing gums. As an adult I’m running away from this and other exaggeratedly chemical fruit smells in any products let alone perfumes. Un Jardin sur le Toit does smell of an artificial apple (at least for a while). But it doesn’t smell cheap at all. I would prefer not to have either an apple or a pear note in the perfume whatsoever (a citrus can stay), but not because I do not like how they are done but because I do not see them in my picture of a rooftop garden. Even if Mr. Ellena had managed to capture the most true-to-life fresh August crop apple smell I wouldn’t be able to place it into the composition. 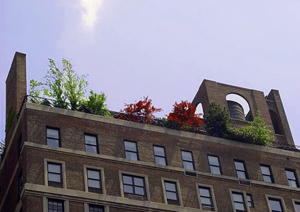 A garden on the rooftop in the middle of the concrete jungle has beautiful bright flowers, colorful bushes, mini trees (orange or lemon tree might be fine on a San Francisco roof) and maybe some fragrant herbs but no apple trees. And I do not want to look for a hidden reference to the Garden of Eden with its Tree of Knowledge. Will I wear it? I could, it’s perfectly wearable. But I do not see the need of having them both – Un Jardin sur le Nil and Un Jardin sur le Toit. So when my bottle of the former is empty I’ll just buy the next one. Unless, of course, Hermès decides to release all four gardens as a set in what I call a perfumista sized bottles (15 ml). Four Wonders of Hermès – not a bad name for the set, don’t you think? Or is a reference to the Hanging Gardens of Babylon to subtle for the mass market? For more [real] reviews see Olfactoria’s Travels, Beauty on the outside, Now Smell This and 1000 fragrances. This entry was posted in Not a Review and tagged Hermès, Jean-Claude Ellena, Rocabar, Un Jardin apres la Mousson, Un Jardin en Méditerranée, Un Jardin sur le Nil, Un Jardin sur le Toit. Bookmark the permalink. I’ve been wanting to try Sur le Toit lately, it interests me, but I’m not racing to get a sample. After reading your review, I’m still squarely on the fence. I need to just go to a physical store and sniff all of them. I wouldn’t have trusted just my opinion, but it looks like many other reviewers weren’t too enthusiastic about it as well. So approach with caution. It’s funny how something nags at you to keep trying a fragrance you thought you didn’t like. I’ve had that experience. I’ve also successfully gone back to fragrances I wore to death and grown tired of in the past. Trying Un Jardin sur le Toit might be even harder for you because of a season. Either you like it or not but this is a warm(er) weather perfume. Currently I’m planning couple of “come backs” – just to see if there are any feelings left. Forgot to say thanks for a great, thoughtful review. The sad part is that my first life story that came the closest to be considered a review is about the perfume that I merely like. Interesting review Undina- I felt the same as you, that the apple didn’t fit the rooftop scene. That said, I find it works well on skin. I went through a bottle and a half of Jardin sur le Nil even though it wasn’t quite perfect on me. Now that I have gotten over that infatuation, the next bottle may very well be Jardin sur le Toit. Either that or Hermes Eau de Gentiane, which I am falling for…greenery and dark chocolate loveliness, however fleeting! I haven’t even attempted to try Eau de Gentiane after Robin’s (NST) luke warm review: “… it’s possibly one of the nicest laundry-clean fragrances I’ve ever smelled, but there’s really almost nothing you could do with a laundry-clean fragrance, haute or otherwise, that would make me want to own or wear it”. So I should not have an opinion but I do :) : go for Un Jardin sur le Toit – at least you’ll get decent tenacity for your money. Haha! Thanks :) EdG did not evoke clean laundry for me, but I do appreciate a straight-shootin’ review! On first sniff, sur le Toit didn’t do anything for me, so I haven’t been racing to try it on my skin, but your review makes me wonder how the apple will develop on my skin. I think if the perfume comunity keeps writing about smaller bottles more and more companies will be listening.